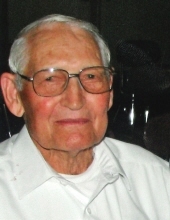 Arthur Perry, 91 of Crab Orchard, passed away Wednesday, January 23rd, at the Fort Logan Hospital in Stanford. He was preceded in death by his loving wife of 62 years, Flonnie Beatrice (Smith) Perry on October 26, 2012. Arthur was born in Lincoln County, Kentucky on November 24, 1927 a son of the late Adam and Mamie (Owsley) Perry. He was a member of Calvary Apostolic Church in Paint Lick. Visitation will be after 11:00 am, on Saturday until funeral time at 1:00 pm at McKnight Funeral Home. To send flowers or a remembrance gift to the family of Arthur Perry, please visit our Tribute Store. "Email Address" would like to share the life celebration of Arthur Perry. Click on the "link" to go to share a favorite memory or leave a condolence message for the family.